This light chain pull is crocheted in red, white and blue — but you can use any colours from your scrap crochet cotton collection. 28 gauge wire or what you have. Rnd 1. With blue, ch 8, join to form ring. Ch three, 23 dc in ring. Rnd 2. Ch 3, dc in same st as joining, dc in next st. (2 dc in next st dc in next st) repeat around, join in 3rd ch of beginning ch 3. Rnd 4. Ch 3, dc in each of the next 3 sts, (dc dec. dc in each of the next 4 sts, dc dec.) repeat around. Join in 3rd ch of ch 3. Rnd 5. Ch 3, dc dec, (dc in next st, dc dec.) repeat around. Join in 3rd ch of ch 3. Rnd 6. Repeat rnd 5. fasten off. Rnd 7. Attach white with a sl st in same st as joining, Ch 3 working in front lps, only this rnd, dc in same st as joining, 2 dc in each remaining st around. Join in 3rd ch of ch 3. Rnd 8. Ch 3, dc in same st, 2 dc in each of the remaining sts around. Join in 3rd ch of ch 3. Fasten off. Rnd 9. Attach red with a sl st in same st as joining, repeat rnd 8, do not fasten off. Rnd 2. Ch 3, dc in same st as joining, 2 dc in each remaining st around. Join in 3rd ch of beginning; ch 3. Fasten off. Rnd 3. Attach white with a sl st in same stitch as joining. repeat rnd 2. Fasten off. Rnd 4. Attach red with a sl st in same st as joining. Ch 3, dc in each remaining st around, join in 3rd ch of beginning ch 3. Rnd 5. repeat rnd 9 on hat. fasten off. Hide tails. Thread the wide eyed needle with the the wire, and starting from the bottom of the collar, go thru rnd 1, not the hole on the right side go thru the top of the head, go back thru the head, and twist a loop for hanging, and then go thru the lft side of rnd 1 of the collar. Knot off and clip the ends off. 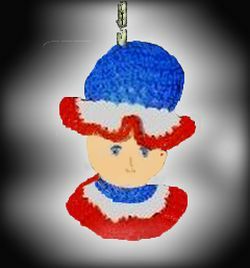 Now just attach the crocheted doll to your light chain pull and enjoy.